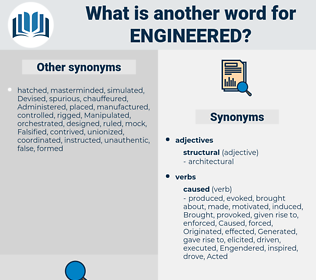 What is another word for Engineered? artificial, manufactured, designed, contrived, serviced, man-made, developed, equipped. 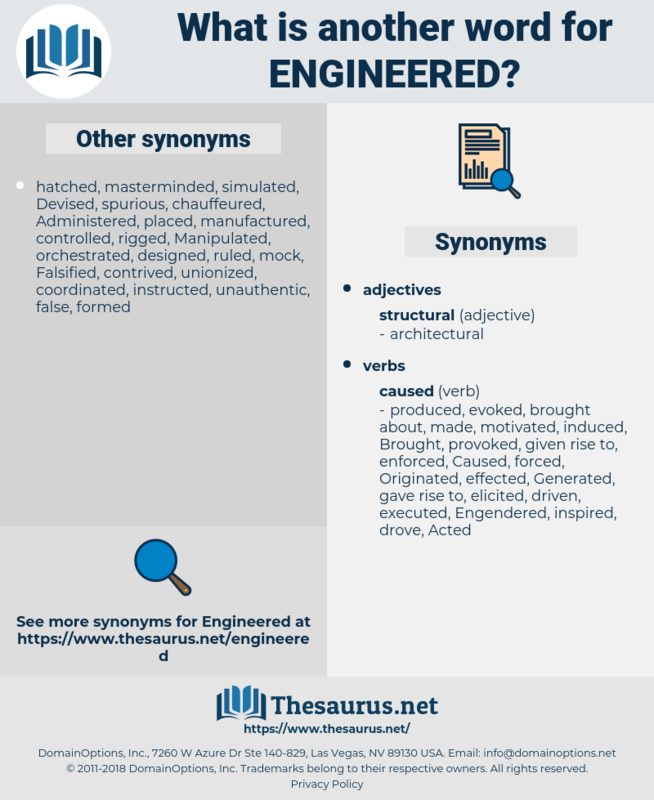 Engendered, redesigned, triggered, rearranged, envisioned, conceptualized, reorganized, Differenced, arranged, reconsidered, Originated, refined, organized, organised, Generated, Fathered, co-organized, outmaneuvered, altered, fabricated, invented, masterminded, imagined, written, manufactored, articulated, impeded, Manipulated, hardwired, Tampered, guided, geared, architected, finalized, Steered, Enabled, Instituted, authored, labeled, renamed, finalised, reformulated, revised, figured, tailored, powered, experienced, anticipated, reworded, edited, rectified, Influenced, changed, structured, producted, Overseen, Targeted, provoked, constituted, restated, readjusted, prepared, brainwashed, Compiled, fledged, Drafted, framed, upgraded, prepped, pictured, tested, corrected, revamped, amended, renumbered, induced, Regarded, dreamed, sparked, Devised, Contemplated, Construed, formulated, perfected, assembled, driven, Commanded, spearheaded, directed, redrafted, fashioned, disturbed, produced, Erected, elaborated, Undertaken, traced, curated, Marketed, addressed, packaged, crafted, Deviated, varied, modulated, Installed, pursued, Aimed, adapted, Occasioned, adjustable, located, Waged, adjusted, Convened, handled, modified, scheduled, suited, supposed, posed, paved, co-hosted, modeled, Modelled, cooked, outlined, scoped, affected, Mapped, Caused, Lived, Spawned, formed, Shifted, held, Fitted, shaped, hatched, unleashed, conducted, Evolved, headed, Prompted, tuned, hosted, packed, sorted, placed, led, laid, put, Meant, mounted, Gotten, thought, made, manufactured, developed, equipped.